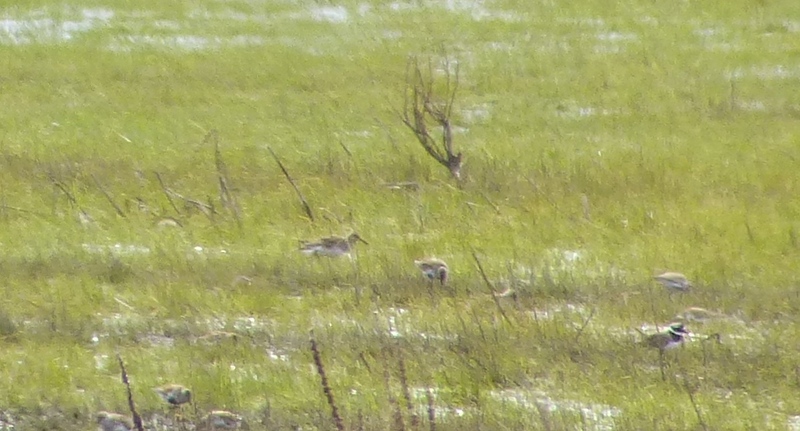 An excellent text from Bazzo at 12.30pm today saw me scurrying down the path to Nels as fast as my stubby little legs could carry me 20 minutes later for a butcher’s at the Pectoral Sandpiper he’d just discovered. Don’t know why it happens, but whenever you’re trying to get down from Marshside Road to the hide quickly, the path seems to get longer with every step you take. 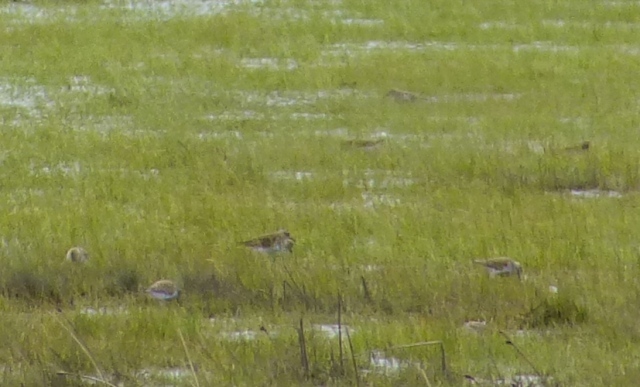 Luckily it didn’t go far and we ‘scoped the Pec Sand as it fed with Ruff, Dunlin and Ringed Plover in the wet grass south of Nels for half an hour or so before I lost it in the vegetation. 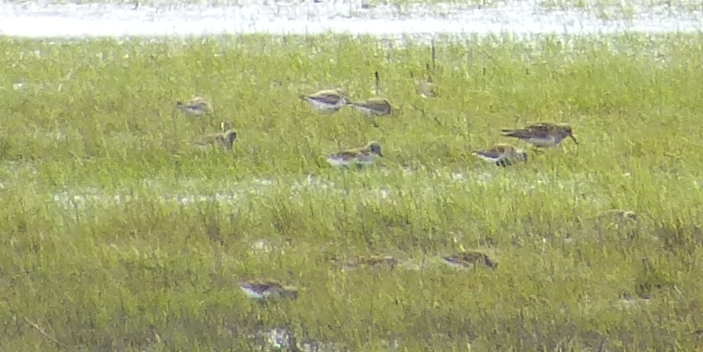 At least 200 Dunlin on Marshside One, probably more, but restless. 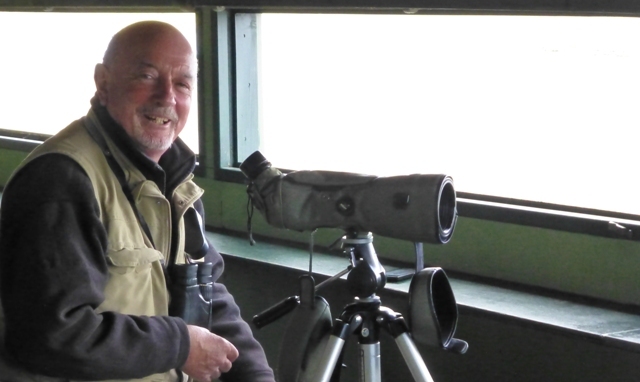 The man they call “Mr Marshside” (if they don’t, they should) is certainly on a roll this spring with Pec Sand, Redstart, Wood Warbler, Cetti’s Warbler and Ring Ouzel all nailed by himself on the patch. Nice work Bazzo… and my first Swift of the year into the bargain, just squeaking into April and arc-ing south. Crushing the spirit like an anvil, the brutally cold westerly put paid to any serious passerine passage on the coast today (a seawatch would have been a better bet). Had a quick look at Weld Road which hosted a single Meadow Pipit. I nipped up to Marshside at lunchtime anyway and spent some time chilling my marrow on the platform at Hesketh Road. Swallows, House and Sand Martins struggling to sail the wind, and Reed Warbler singing in the SSSI reminded me that it will be warm again one day (maybe), otherwise scanning through the waders seemed the sensible option. Up to 70 Dunlin and 15+ Ringed Plovers at the back of the lagoon, with at least three winter plumage Dunlin, doing their best Curlew Sand impressions, Ruff and Redshank, but it was hard keeping the ‘scope steady in the wind. 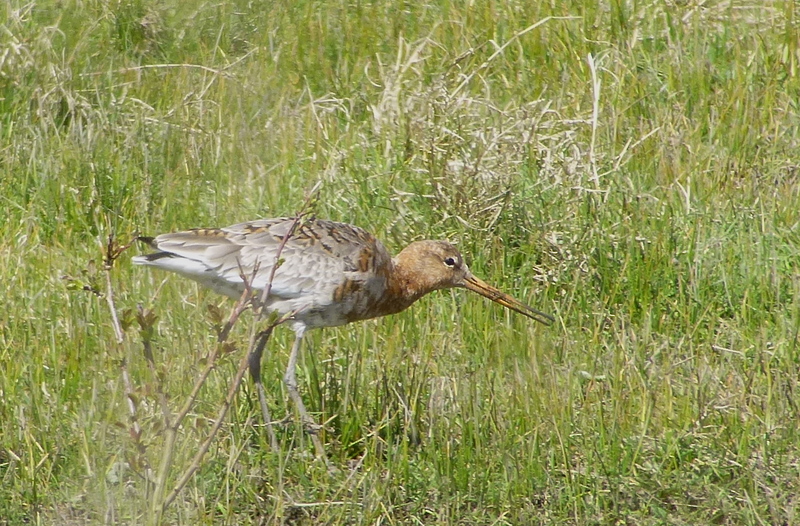 Checked through 120+ Blackwits, many in glorious summer plumage, for something else without success – but you never know. My Banana Splits ‘jamas were still warm this morning, and the sand of Bryher still clung to my boots, but when the Hudsonian Godwit of fate (or rather a road-raddled Neill Hunt) comes calling you can’t say no. 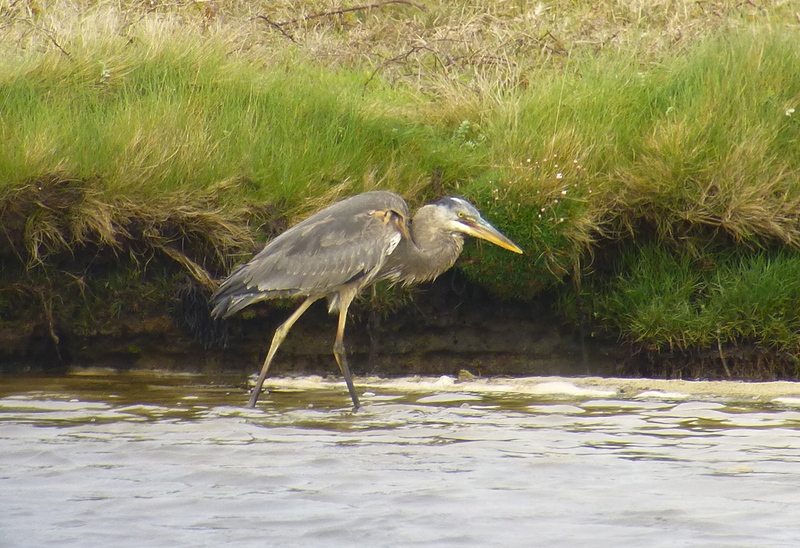 We’d only returned from our successful day-trip to the Isles of Scilly for the Great Blue Heron at 1.30am this morning, but we were back on the road down to Somerset and the vast reedbeds and pools around Meare Heath by 12.15pm – what’s 1,300 miles in 48 hours between friends??? Got to Meare for about 4.15pm and joined the large crowd to learn that the Hudsonian Godwit had just flown off – Bitterns, Great White Egrets and Cetti’s Warblers were small consolation. Luckily the Hudsonian Godwit flew back a few minutes later and we had stunning views as it fed on a lagoon with Blackwits. If you’ve ever wondered if you’d miss one of these things in a flock of godwits, don’t worry, it was really obviously darker than any of the Blackwits, despite the fact that at some angles the bird looked almost sandy – but never as light as a winter plumaged or young Blackwit. 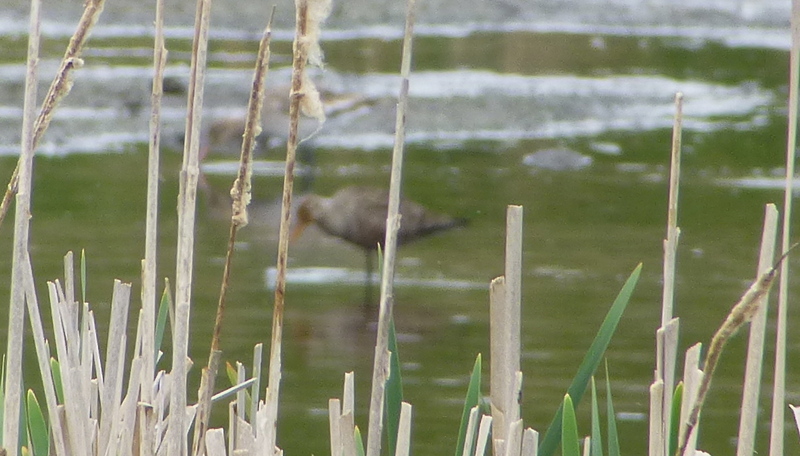 The Hudwit had gorgeous crisp tight barring on the dark, brick reddish-flecked belly and vent and a yellowish upturned bill with dark tip. Its chest and head was paler. It really jumped out in the scope. About the same size as the Blackwits, when it flew its amazing dark underwings with a white flash contrasted strongly with the bird’s white rump – an incredible critter. Superb views, but by the time I’d stopped ogling it and got my camera out I found the reeds of the lagoon bank prevented me getting a single in-focus digiscoped shot as my “point-and-press” kept focussing on the stems rather than the bird. I’ll include this – if you squint really hard, you can just make out some of the barring on the underparts, but I don’t think I’ll be sticking it on Surfbirds any time soon. I hoped the bird would walk closer to us and I could blat away unhindered by vegetation but suddenly all the waders took off, the godwits wheeled about in front of us (breathtaking flight views of the underwing) and then split up. About 70 landed back on the pool again, but the Hudsonian superstar and about 15 others kept flying and disappeared from view over the reeds and scrub at about 4.30pm. It didn’t come back, but its still burned on my retina now. 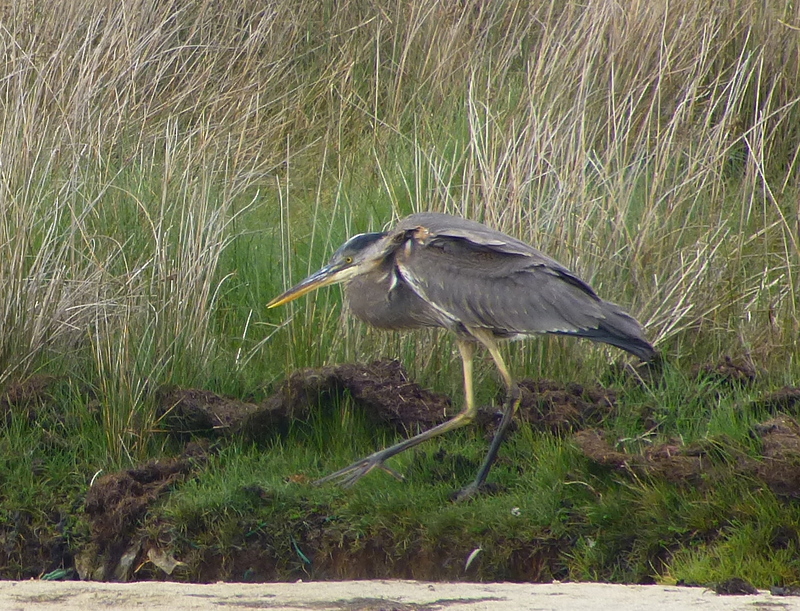 No such problems with yesterday’s Great Blue Heron on Bryher. With Pete Allen and Jason Stannage, Neill and I had set out at 11pm on Thursday, ripping south by south west in the blue streak of acceleration that were Neill’s wheels. 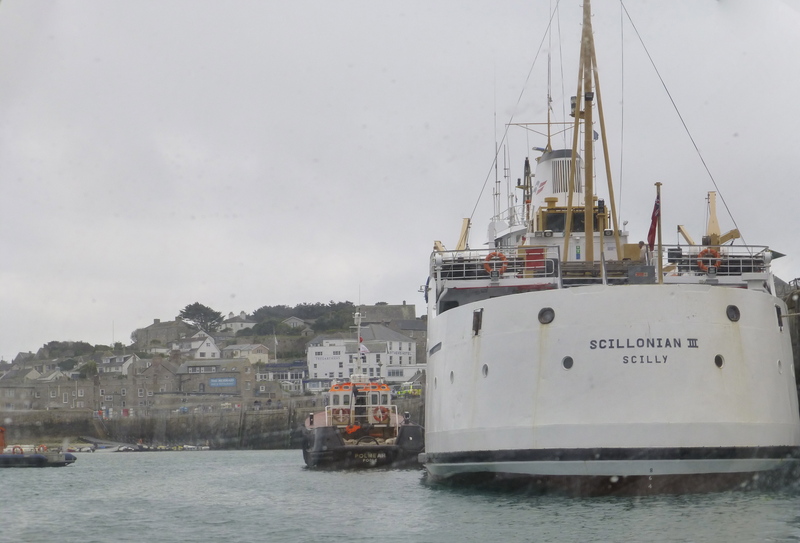 Racing past Indian Queens with the rising sun at our backs, we boarded the Scillonian III from Penzance at 0915, landing on St Mary’s at midday. Jason had craftily booked us a boat in advance to get to Bryher, so we jumped aboard the jet-powered Falcon, and were leaping ashore on Bryher before you could say “agapanthus”. 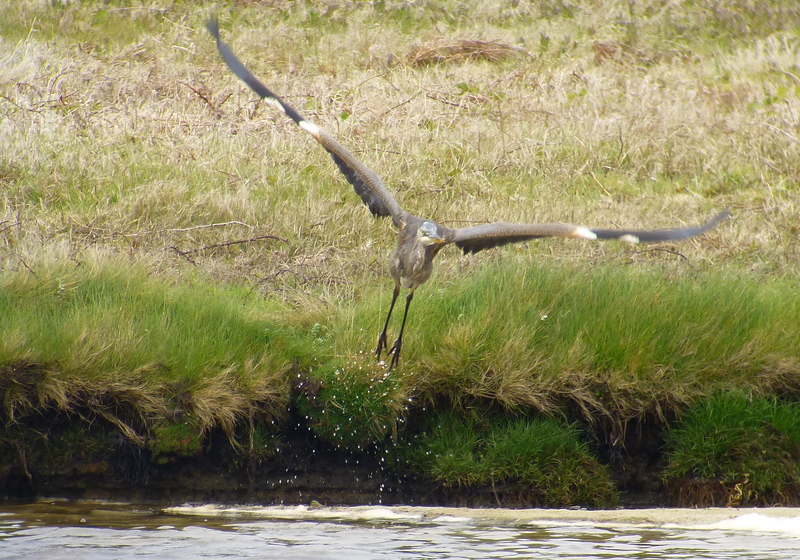 A brisk walk over to the Hell Bay Hotel and Great Pool later and the Great Blue Heron flew in to show off. Huge, bandy legged and balding on the crown I can honestly say the massive Yankee heron was a prime candidate for ugliest mega ever. Its raggedy mantle feathers didn’t help, and despite its excellent herony fishing skills it looked like it had been dragged through a big hedge backwards. We were all delighted to see it though. Great tickety tick – happy days! 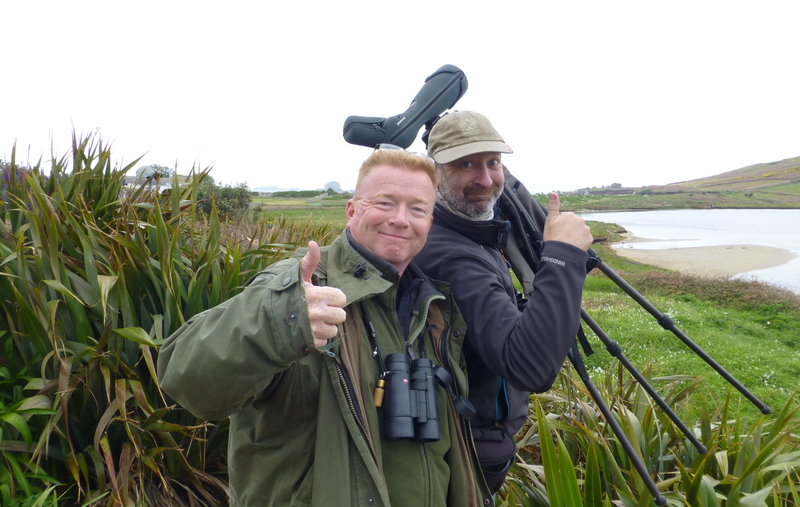 Tree Pipits, Wheatear, Little Egrets and a few phylloscs helped pass the time before the Falcon came to pick us up and whisk us back to St Mary’s, where we managed to ram a swift Guinness down in the Mermaid (scene of so many riotous days back when) before boarding the Scillonian. Sailing over earlier in the day Manx Shearwater, Fulmar, Gannets and auks passed the Scillonian, but the cruise back was best spent trying to grab some shut-eye below decks in preparation for the next round of Man versus Tarmac. What an astonishing couple of days – two mega tickety ticks and wonderful company, but I don’t think I wanna see a motorway again for a little while (unless a Calandra turns up at Flamboro’ tomorrow of course Neill). Ridiculously warm late afternoon in Haskayne Cutting today, and not surprisingly the place was stuffed with butterflies – many, many Peacocks, with Large White, and a superb Brimstone around the brambles beneath the old road bridge. Plenty of Orange Tips emerging too – this has always been a “hot-spot” for this species. 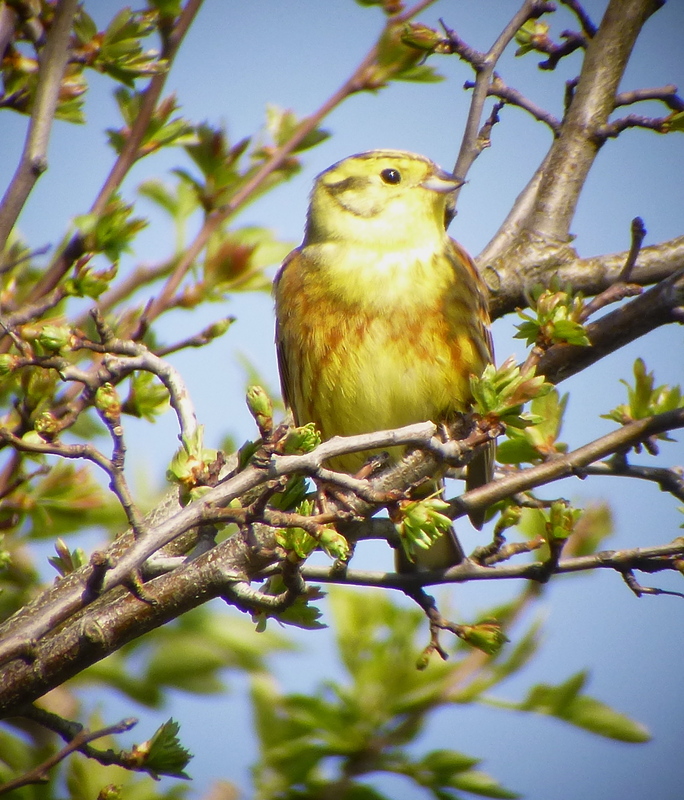 Chiffies and Yellowhammer singing away, and at least four Blackcap – the latter seems to have taken over the world this spring, they seem to be moving through or singing away wherever I go. 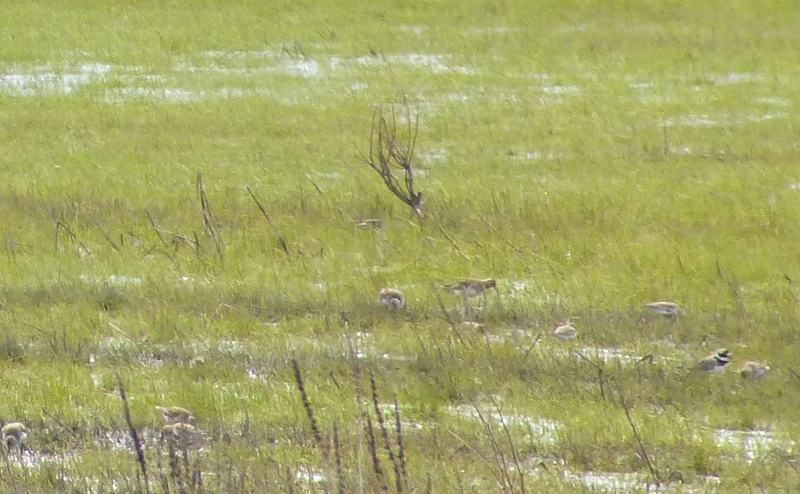 Wheatears, White Wags and hirundines, with Buzzards, Lapwing and Corn Bunting on Plex, just as it should be. Four Willow Warblers, Chiffies, and of course at least two Blackcap, singing away here too. With two Sarnie Terns fishing offshore from the tower this morning, and all that lovely blue sky and sun, I decided to give a seawatch a go over lunch at Ainsdale today. Very gentle f3 SWly, but a bit misty as a 10 metre plus flat calm high tide slid in. Nowt to steam me ‘scope up, but Red Throated Divers were obviously moving north – small hunchbacked parties passing by regularly about halfway out. A few were well into summer plumage as they “periscoped” along. Three Harbour Porpoises showing well too about 100 metres off. Curlew, Grey Plover, Oycs, Mipits and Linnets as per usual over the dunes. All shed-owners know and fear the words. Guaranteed to send a shiver down the spine. How will I ever replace that ten-year-old packet of bone meal? Where will I find an old bin bag full of rotting twigs like that one? And as for the box of rusty nails and old Wood Mouse nest, well…. It’s gonna take me years to fill the shed with that much crap again. Easing the pain, Holly Blue and my first Brimstone ever in the garden at Dempsey Towers yesterday, with what looked like a Wall zipping past in the warm sun. To get over Shed Trauma 2015 I reset the alarm and drove down to Cabin Hill WAY too early this morning, stumbling down Range Lane at 0715 after a light frost. 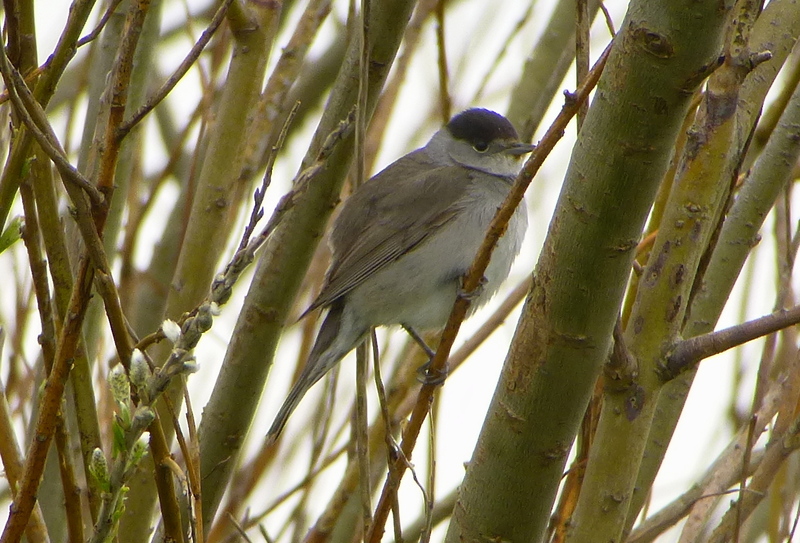 The nip in the air kept the phylloscs quiet till about 8am, but plenty of Blackcaps were singing or feeding around the site. Once it warmed up a tad, the Willow Warbler chorus really rang out. A scattering of Wheatears and growing numbers of Swallows as the morning yawned and got its dog-walkers on, although the highlights were undoubtedly a buzzy Tree Pipit over the grazing enclosure and a reeling Grasshopper Warbler in the dunes. 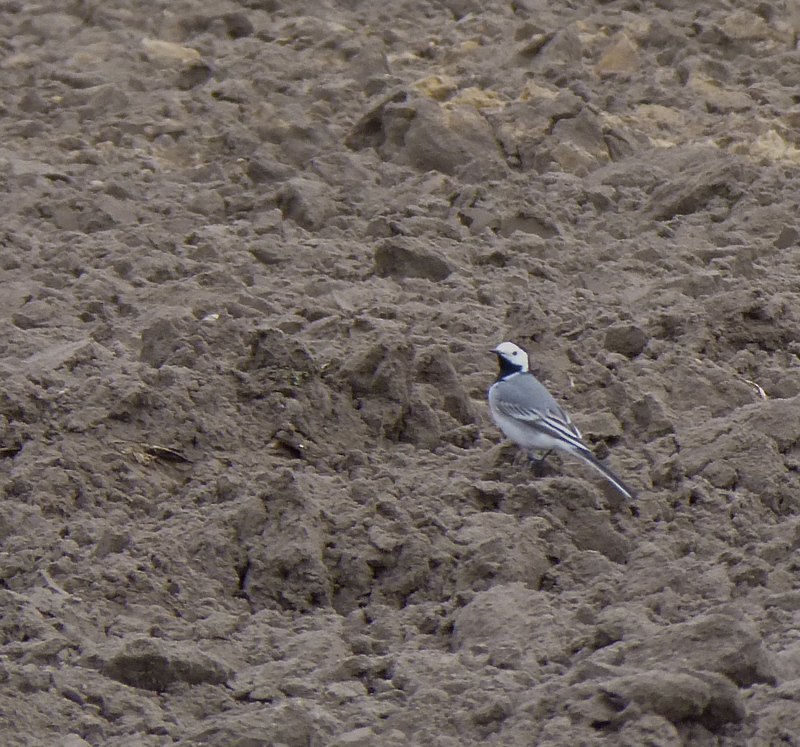 Despite two circuits of the site, it didn’t feel like much was moving, so as I was in that neck of the woods, I headed down to Gorsey Lane behind Hightown, where 70+ splendid White Wagtails were feeding in the ploughed fields, and at least 3 Corn Buntings were singing. A quick trawl of the mosses in case of any early “you-know-whats”, produced a fine Merlin on the Withins, which sped off before the wheels had quite stopped (hence pants shot above) – as they always do. A Peregrine terrorising waders at Weld Road, then Wheatear and singing Reed Warbler, Willow Warblers, Chiffies and hirundines early doors at Marshside today before I picked up Bazzo and we gave the golf course and reserve a proper spring looking at. Blackcaps moving along the bank and footpath bushes on the golf course with more Willow Warblers and Chiffies suggested there was at least some movement going on during what at first glance appeared to be a fairly slow morning, apart from the warblers that have been on territory for the last week or so. Seven Siskins through raised spirits further, as did growing numbers of hirundines. The first winter Little Gull was still stuck in an infinity loop over the Junction Pool, and there were about 2,000 Pinkies on the outer marsh. Three Great Crested Grebes were on the sea off Hesketh Road, out past the roosting waders. 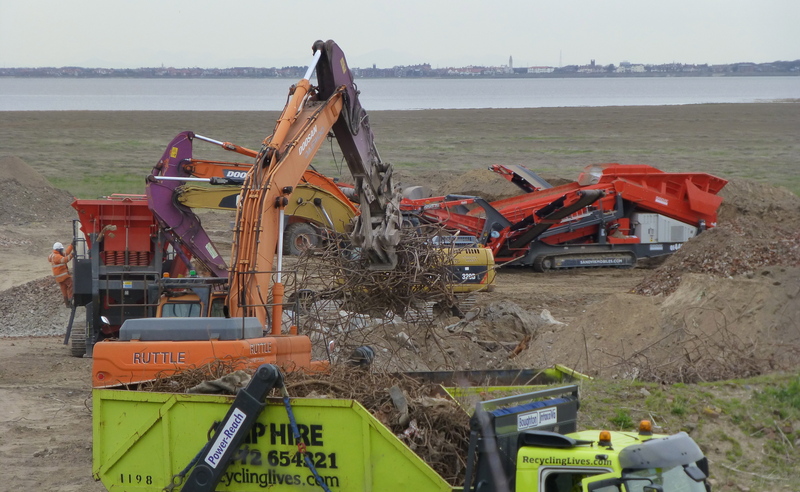 Although the world’s slowest disappearing trick was still in full swing at the Sandplant, a bit of ‘scopage from the remaining high ground revealed an impressive 44 Eider on the rising tide, either in the shallows or up on the drier areas of the marsh out past Crossens. Obviously numbers have been growing steadily on the Ribble for a number of years now, but that’s my best count for Marshside so far… 33 males and 11 females. 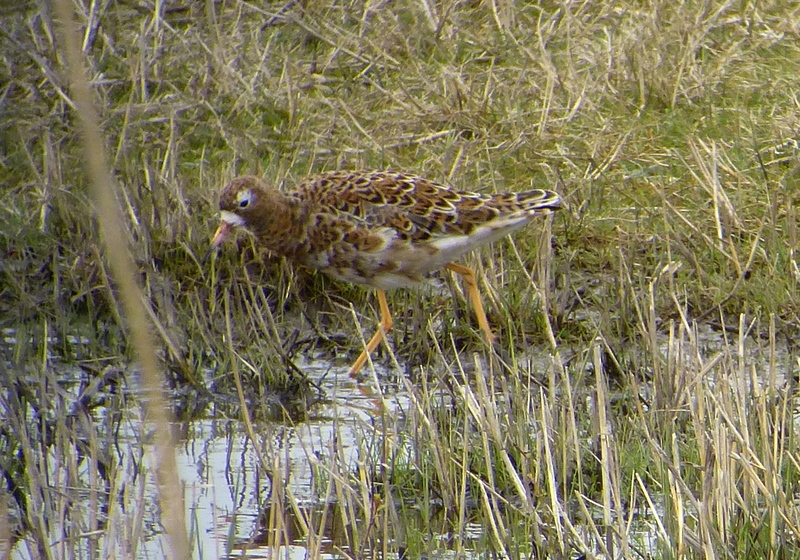 More hirundines, Willow Warblers and Chiffies later, and we made it to Nels, which was kinda quiet, but the regular waders were good, including some stunningly dressed Ruffs. Singing Reed Warbler here as well as one cranking up in the SSSI ditch. Sandgrounders was sloooooow, apart from a Common Sandpiper on the lagoon, so we buzzed up to Crossens, where seven Wheatears were at the top end of Crossens Inner. 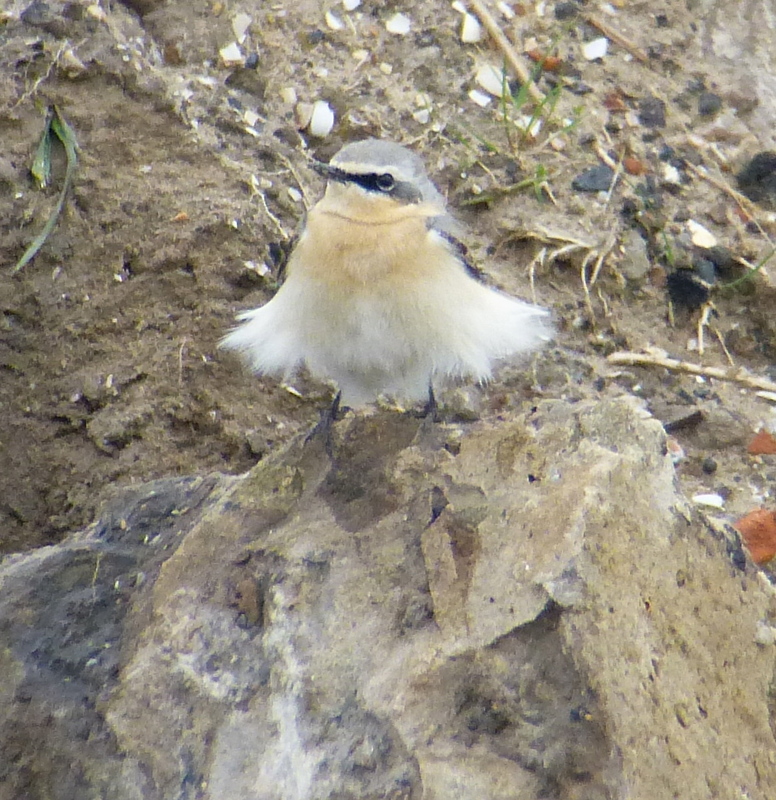 The smart money rolled over and stayed under the duvet this morning, so some credit must be due to this Wheatear (one of five at the Sandplant) for coming on all “Bird of Paradise”. Truth be told it was pretty grim early doors, with far too much rain and a cold, mean and strengthening south westerly that seemed intent on stopping passage as quickly as climatically possible. I’ve never heard a singing Willow Warbler that could be described as sad before, but two of ’em on the golf course managed to sound particularly depressed – at least 6+ Chiffchaffs put their heart into the singing business, although to be fair their tune has fewer notes. Half-assed Blackcap in the central copse was barely audible over the wind, with Siskins and Mipits struggling through overhead and a few Goldcrests about. 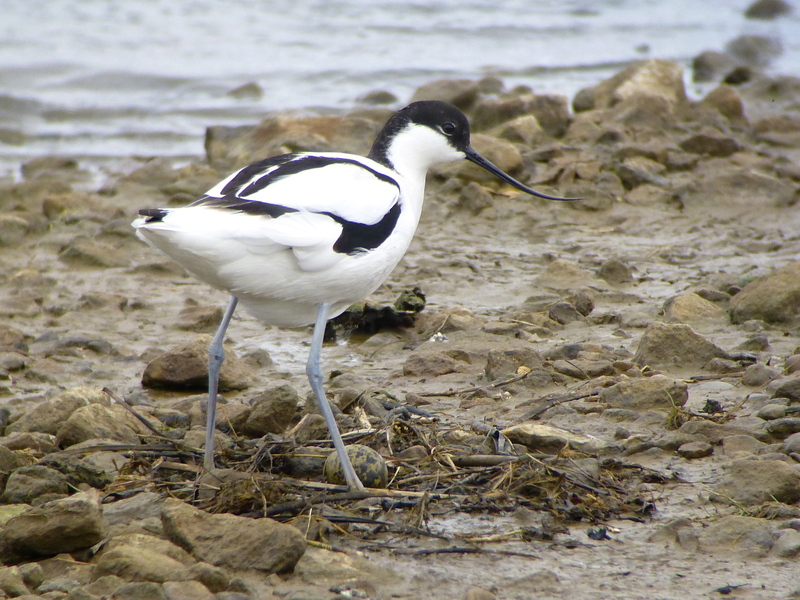 The logbook in the hide recorded the Avocets laying this egg in front of Sandgrounders late yesterday afternoon, but despite the cold wind and rain, the parent spent most of its time staring at the egg rather than sitting on it and keeping it warm – one for the rats I fear. 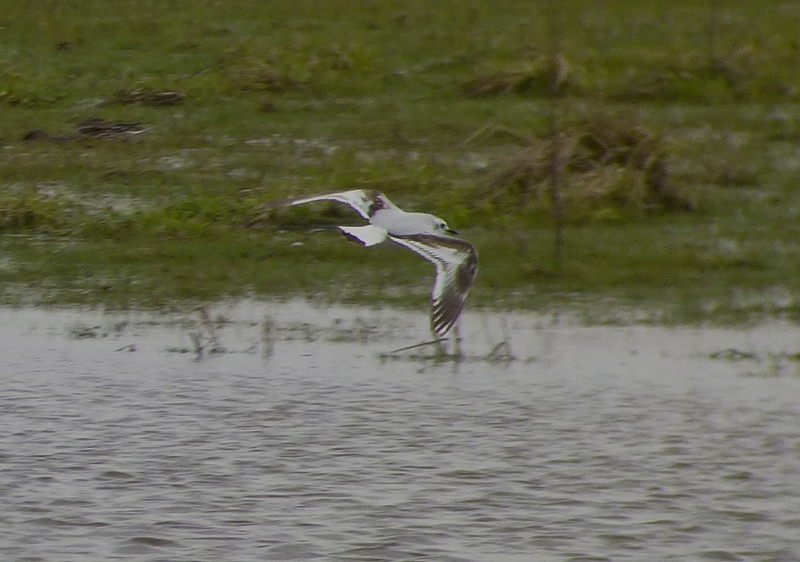 The Little Gull was still about at Junction Pool, but was largely sheltering in the grassy tussocks at the back, while wader-wise 350-ish Golden Plover, 30+ Ruff, Ringed Plovers (4) and Dunlin (14) amongst the Avocets, Lapwings and Blackwits, made it worth scoping from Nels for an hour or so. 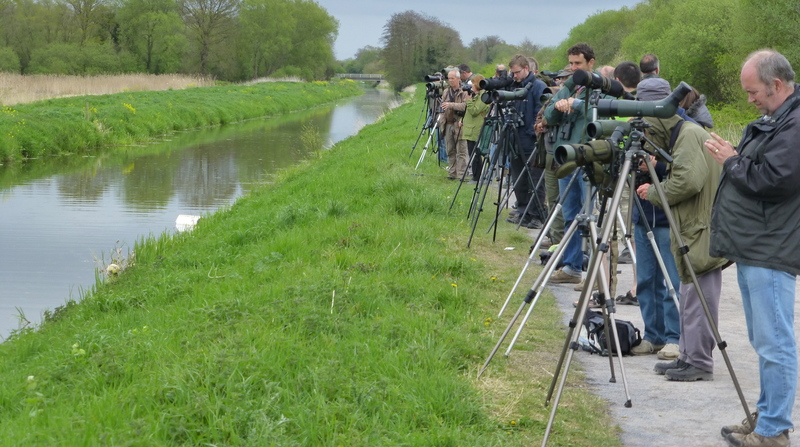 Hirundine numbers were predictably low – five Swallows in total. Several small family groups (?) of Pinkies dropped onto Marshside One for awhile before heading back out onto the estuary. By lunchtime the wind was gusting right up to gale force, and let’s be honest, when the hide starts to shake as if Carny-Folk are trying to get you off the last waltzer ride of the night, you know its time to head for the hills and pen protest letters to the Maltese Govt over their support of the spring bird massacre. Sometimes you just gotta get out, so in a busy week that ain’t over yet, I grabbed 45 minutes down at Marshside late this afternoon. 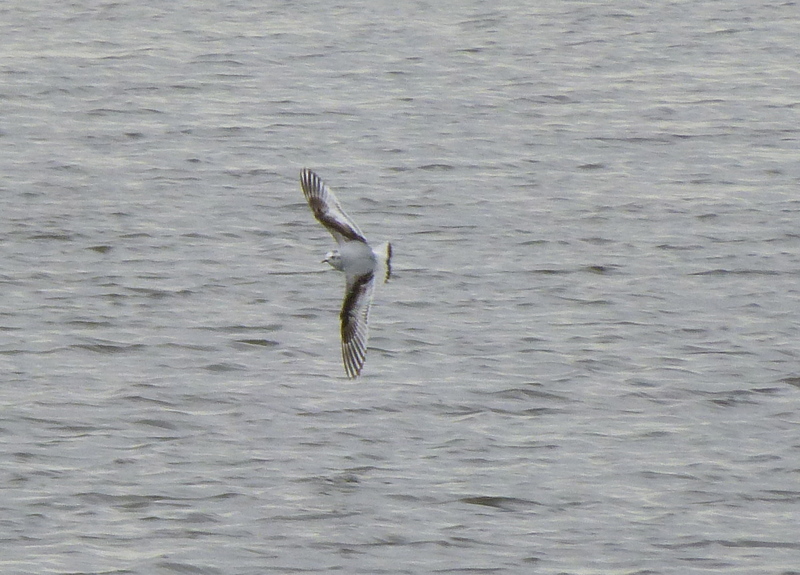 The young Little Gull was still feeding away over the Junction Pool, relentlessly sweeping up and down, and grabbing midges off the surface when it wasn’t being hassled by BHGs. Made me feel dizzy watching it – perpetual motion is all well and good, but a nice sit down has its plus points too, so I went on to Nels and enjoyed the Golden Plover, Avocets and yikkering Little Grebes. 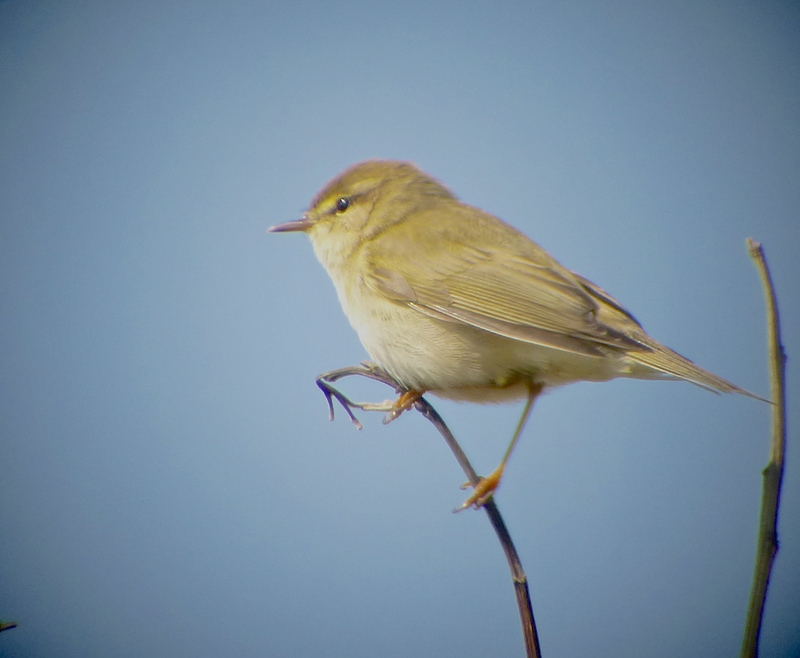 Just one Chiffchaff in the bushes there. A loose cloud of about 70-100 hirundines were hawking over Marshside One, mainly Sand Martins and Swallows with one or two House Martins. Before the evening air dropped cool it was wonderful to watch ’em, despite the rush hour drone building on the Coast Road behind me. 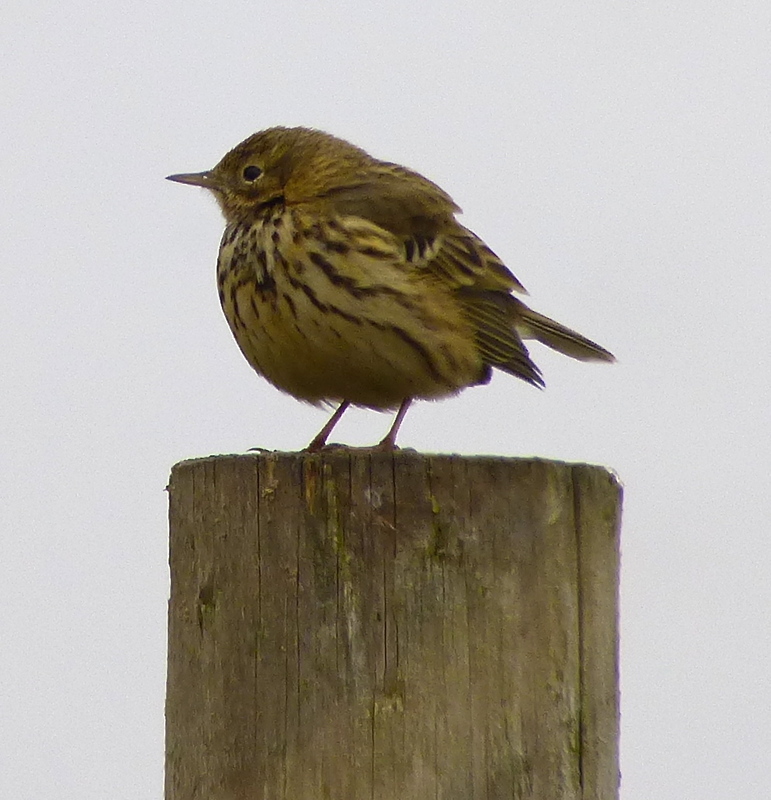 Got down to Cabin Hill for a good rummage this morning – large numbers of Meadow Pipits on the move, with a few groups of 20+ birds grounding here and there, and “bleeping” up in the mist the soundtrack of the morning. Odd there were only a handful of alba wags. At least four Greater ‘Peckers through – they can’t all have been local birds. 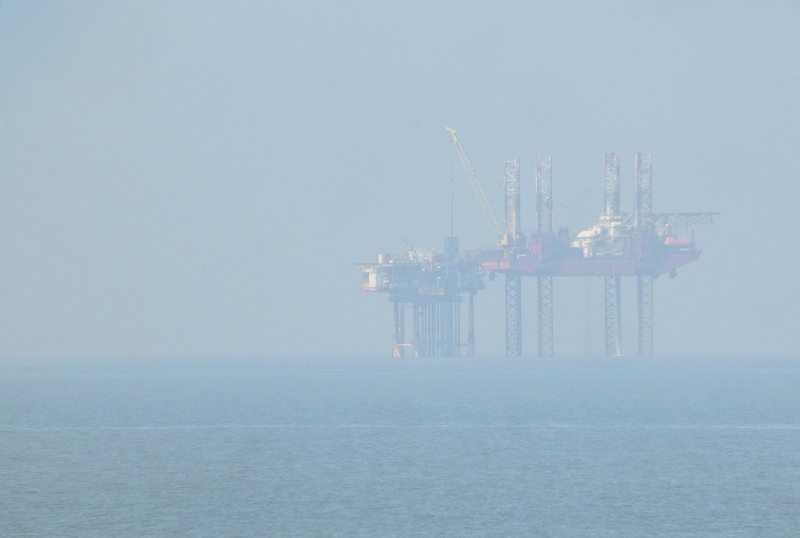 Thick mist and the claustrophobic tolling of a fog horn out in the bay added to the atmosphere, but unfortunately the birds hadn’t read the script – spring megas were conspicuous by their absence. Top marks then to a single speeding Swallow heading south over the fields – can’t blame it given the conditions. 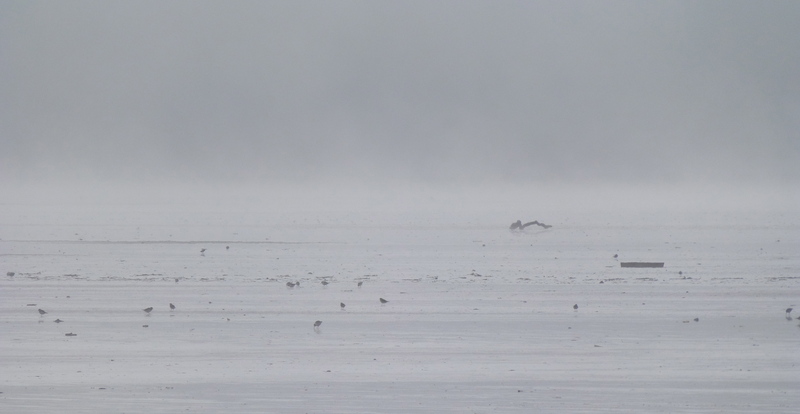 Chiffchaff singing in the trees, while out on the shore the mist made birding nigh on impossible.